The Guide To Road Racing, Part 14: Can You Be Trusted With A Race Start? 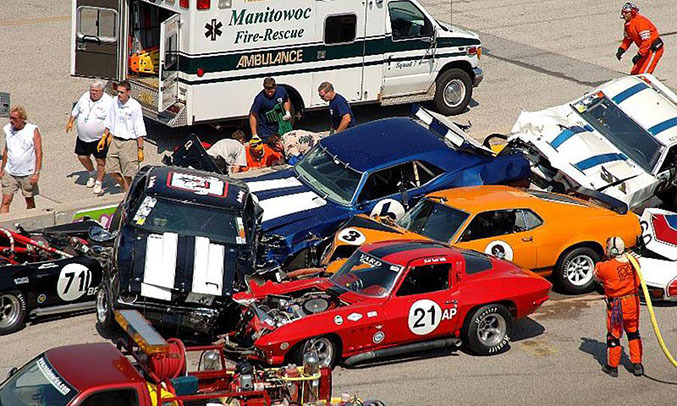 A frighteningly high percentage of wrecks and metal-metal incidents happen on race starts. On the one hand, that’s understandable since that’s where the largest number of cars are very close together. We might say that proximity breeds contact. But the view that “things happen” really doesn’t cover how you should think about race starts. And it doesn’t cover how your fellow racers think about how you start races. In the back of your mind, at least, you know that you trust some other racers on starts. And you don’t trust some. The same goes for how other racers view you. In an amateur sport where cooperation, friendships and, dare we say, honor, are at least as important as finishing position, trust matters. Or should. When you drive your car over another driver’s car, missing his head by inches, it isn’t hard to see why other drivers take a dim view of your approach. Grosjean took the harsh feedback seriously and has worked hard on cleaning up his starts. That first lap crash led to broken legs and a medical helicopter evacuation. It could have been even worse. In that incident you can ask (as many racers did on that weekend in 2015) why red flags didn’t fly earlier and why the unlucky driver managed to run into a group of stationary cars at 100 mph. Those are reasonable questions. But we think you also need to go back and ask “why did several cars, many rows ahead of the cars you see here, have a huge off on the opening lap at what is clearly the most dangerous corner on this track?” That is, the wreck shown here wasn’t caused by the airborne driver, it was caused by drivers who came through earlier, going too fast for their skills or conditions. So, our first conclusion is that your primary job on lap 1 is to drive within yourself while still ramping up to speed quickly and being opportunistic about passing opportunities. If that sounds like “Lewis, please lower your lap times while conserving fuel”, you need to think again. To restate the case your fellow drivers would make, you need to go as quickly as you can and pass as many cars as you can while not driving beyond your skill set. That is a goal with a constraint, not two opposing goals. But the point here is that the driver who hits the car we’re riding in simply drives into cars with no regard for their existence. That does not meet the definition of “driving within yourself and conditions”. In a nutshell: don’t be “that guy”. Don’t be the guy who takes out 5 cars with a divebomb into T1. Don’t be the guy who overdrives on cold tires. Don’t be the guy who jumps the start and breaks other people’s cars when he drives into them. And don’t be the guy who penalizes competitors by 5 seconds on the out lap by lollygagging. The key is to understand that driving within yourself and conditions on the start is a skill. It is a skill that can be practiced. Visualization helps. Working on spatial awareness in your car helps. We’ve found that getting a radio and having a crewmember call the green helps with having your visual focus in the right place. Some like to know if they are gridded on the outside or inside, because it affects where the want their cars heading into T1. Some drivers also practice how much they plan to move their cars so that they can be set up for passing without taking out nearby cars.